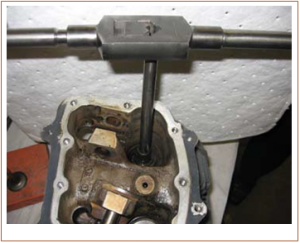 Lycoming Exhaust Valve – A Sticky Situation | Tennessee Aircraft Services, Inc. The above mentioned documents are very thorough, so I won’t take up your time repeating what Lycoming has already detailed. The checks and corrections are pretty straight forward and can help give you many shudder free hours of night flying, or daytime for that matter. A recent CPA forum post on this subject suggested that some mechanics felt the valve wobble check and/or the guide reaming was beyond their abilities. If a mechanic is comfortable with normal field engine maintenance, any of the processes described in the Lycoming instructions are well within his/her abilities. Bear in mind, at no time does the cylinder need to be removed from the engine to perform these tasks. Hopefully, the following bits of information and photos may embolden the timid to give it a go. If already experiencing a sticking valve, you could go straight to Service Instruction 1425A Part III. These are the instructions on how to remove the exhaust valve and ream the guide. Actually, only the sludge that has built up in the guide gets reamed out. Since the diameter of the metal guide does not decrease, the reamer will only be ‘cleaning’ the inside of the guide. This will return the original fit between the valve stem and the guide. All will be well until the contaminates build up again. If you have pre 1998 valve guides, as explained in Service Instruction 1485A, with more than the described 400 hours or post 1998 valve guides with more than 1000 hours, you may want to comply with requirements of Service Bulletin 388C. The tools for your specific model engine can be rented from Lycoming as noted in Service Letter 234B. 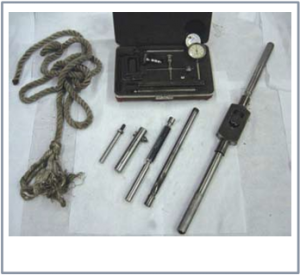 Service Bulletin 388C gives guidance for those more industrious individuals to fabricate the needed tools in the field. I made my tools many years ago and have had occasion to use them with some frequency. Just a little note from experience – completely reassemble each cylinder’s valve train before proceeding to the next. When the valve rocker is removed, there will be no pressure on the push rod and, in turn, nothing holding the valve lifter in place. If the propeller is turned to position for the next cylinder, one of the lifters can slide out a bit and jam against the outer rim of the cam follower, braking off a fingernail size chunk of the follower. The only repair is to split the case halves and replace the cam follower. Please don’t ask how I know this. The primary objective is to measure movement on an extension fitted to the valve stem. The measurement is taken 2 ½ inches above the valve guide and perpendicular to the axis of the rocker shaft. A chart on page 6 of the Service Bulletin shows that measurements in the range of 0.010” to 0.035” are needed. Any tool that will hold a dial test indicator firmly in a position to make that measurement will do. As you can see in the photos, my tooling is very simple but gets the job done precisely and quickly. A few years ago I maintained a small fleet of six cylinder Lycoming powered planes used in a scheduled freight operation. They were an FAA Part 135, and Service Bulletin compliance was a requirement. I was doing this check at least once a month. The time to complete the check on all six cylinders from rolling the tool to the plane to signing the log book was never more than five hours. In four years of maintaining this fleet of five planes, I only had one guide that had to be replaced due to ‘bell mouthing’ and many that had to be reamed due to not meeting the minimum clearance. Dropping a valve into the cylinder and reaming the guide can take an extra 10 minutes up to an hour, depending on the mechanic’s skill at fishing the valve back into the guide. Dial test indicator in fixture being set to 2 1/2 ” above valve guide. Dial test indicator in fixture positioned to measure valve movement toward and away from rocker arm shaft. The newer type ‘Hi-Chrome’ guides address the bell mouthing issue which can lead to poor valve seating. However, I have not seen much improvement with the ‘sludge’ build up that causes the valves to stick. A sticking valve seems to have more unpredictable and immediate consequences than the bell mouthing problem. I’m a big advocate of preventative maintenance. In the long term, and often the short term, preventative maintenance will save you money. A valve wobble check every 400 or 1000 hours is pretty inexpensive insurance to keep the engine shudders to a minimum. Flight safety is truly the issue, and I take every opportunity to not scare my passengers. A serendipitous by-product is that it usually reduces the possibility that I’ll be scared as well. Hand reamer cleaning out the guide. Top” engine shop test using “Go” gauge of 0.4985″ fits snugly as it should. Bottom: “Nogo” gool only 1/2 thousandths of an inch larger than proper hole size fits easily. Not a good thing.